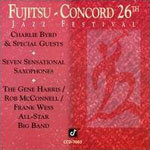 CD review: "Fujitsu-Concord 26th Jazz Festival"
Recorded during last summer's Concord Jazz Festival in Northern California, this two-disc set is a showcase of some of Concord Records' biggest stars. The album starts out with a Latin flavor (the all-jazz Concord label has a Latin jazz imprint, Concord Picante) as guitarist Charlie Byrd's combo performs a seven-song tribute to the late Brazilian composer Antonio Carlos Jobim. The arrangements are warm and relaxing; Hendrik Meurkens chromatic harmonica captures the sensuous nature of Jobim's songs. Adding to the allure of this package is the musical setting on the second disc, grouping artists who normally don't play togehter. Seven Sensational Saxophones features Frank Wess, Rickey Woodard, Ken Peplowski, Jesse Davis, Gary Foster, Chris Potter and Bill Ramsay running through a set of five songs by composers like Tadd Dameron, Horace Silver and Gerry Mulligan. These all-stars push each other on each track, nobody wanting to be shown up, fighting over every measure. The highlight of the album is the Gene Harris/Rob McConnell/Frank Wess Concord Jazz All-Star Big Band. Basie alumni Wess and Harry "Sweets" Edison (trumpet) join the above-mentioned leaders, plus San Diego's Jeannie (piano, vocals) and Jimmy Cheatham (trombone). Jeannie brings the house down on "Tain't Nobody's Business," with the band in full roar behind her growling vocals. This is a great set all around, and the only available live recording by the Cheathams (who also join the big band for a run through of their original "What Do We Do For Fun? ").